It was June 29, and Dexter Rawlings had finished his first day of on-the-job training, installing solar panels on the rooftops of Washington. After hours under the unforgiving summer sun, he arrived home, exhausted. But an email was waiting for him with an encouraging message: The work he had done was projected to save local homeowners more than $11,000 in energy bills over the lifetime of the panels. “I screenshotted it and posted it on my Instagram to show everybody what I was doing over the summer,” Mr. Rawlings says. Rawlings, 24, is a D.C.-native, though he grew up in a foster home in nearby Maryland. This summer, he was a member of the first cohort of Solar Works DC, a partnership between the city and the nonprofit GRID Alternatives that trains workers for solar jobs. Many of the participants come from Washington’s poorest areas, and over the next three years will be paid to install solar panels on 100,000 low-income homes. In recent years, rooftop solar has become one of the fastest growing industries in the United States. Dramatic reductions in the installed price of solar panels, a robust federal rebate program, and the potential for long-term energy savings have fueled soaring interest in residential solar installation. That surge has heightened demand for laborers trained in solar installation, resulting in a crucial skills gap. 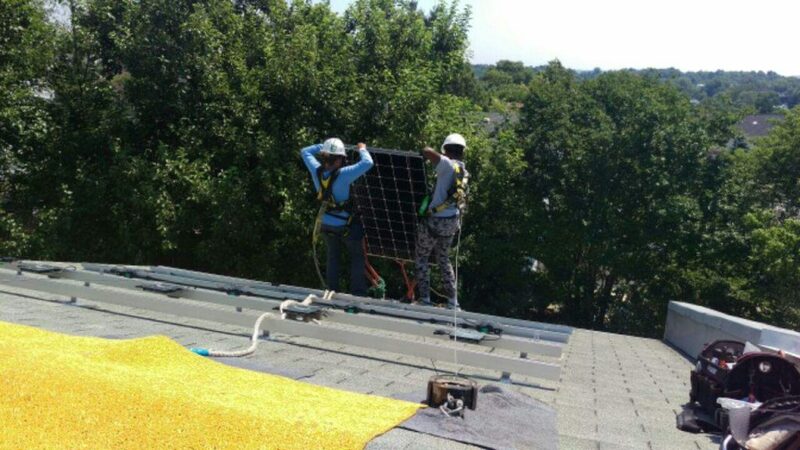 Solar Works DC aims to bridge that gap while bringing the energy savings of rooftop solar to low-income residents. In 2016, US solar companies employed 260,077 workers – up 25 percent from 2015, according to the Solar Jobs Census released by the Solar Foundation and the Department of Energy. While employment has tripled since the first census in 2010, two-thirds of American solar firms report facing difficulty filling positions from manufacturing to sales. Last year, the District of Columbia had 1,180 solar jobs, and industry analysts anticipate a 26 percent increase this year. Over the next 15 years, the nation’s capital plans to invest close to $300 million in solar, according to Tommy Wells, director of Washington’s Department of Energy & Environment (DOEE). 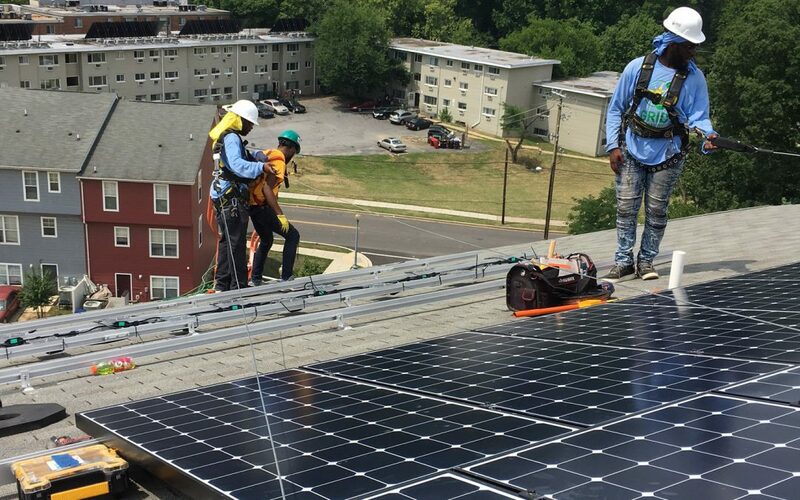 Solar Works DC is one of several partnerships that GRID Alternatives has with municipalities across the US to bring renewable energy technology and job training to low-income communities. In its first three years, the program aims to provide on-the-job technical training to more than 200 D.C. residents. Like Rawlings, 23-year-old Devonta Sanders was part of Solar Works’ summer cohort. Mr. Sanders says he didn’t know anything about solar power when he started. “I wanted to get a new skill-set to put under my belt,” he says. After six weeks of on-the-job training, Sanders says he now feels comfortable installing solar panels from start to finish. And he has plans to spin that training into a full-time career. From day one, Solar Works trains participants in all aspects of the installation process – from the electrical groundwork to laying panels on the rooftops – as well as in sales and outreach. Upon arriving at a house, sometimes as early as 7:30 a.m. to beat the heat, the group would split into two: a roof crew installs panels while the ground crew focuses on electrical work. “Everyone works as a team to get the job done,” Rawlings says, animatedly describing his work day. While Sanders says he prefers working on the roof, it has its challenges. “A few times I felt the heat through my shoes,” he says, laughing. Now, inspired by a summer spent on the rooftops, Sanders says he plans to continue working on installations for GRID Alternatives and aspires to be a solar instructor. That’s exactly the kind of pathway to career employment Solar Works aims to carve for local residents, says DOEE director Mr. Wells. For many participants, the work goes beyond providing a paycheck. “Instead of working in a restaurant, I was out here actually helping people,” says Rawlings. While Solar Works aims to engage lower-income residents of all ages, there is a focus on young people, says Alexis Harvey, workforce coordinator for Solar Works. As a D.C. native, Ms. Harvey, 24, knows first-hand how limited opportunities can seem when growing up in an underserved urban environment. Solar Works, she explains, is a step toward changing bad habits and attitudes, breaking vicious cycles in the process. “I’ve seen the whole ‘Oh, you ain’t going to be nothing,’ ‘In order to get money you got to sell drugs,’ ” Harvey says. “That’s the only way they know how to do it because that’s what’s been taught.” Solar Works, Harvey adds, offers urban youth new dreams. Wells says the district is investing more in solar on behalf of low-income communities than any other city in the US. “We recognized that it was a tremendous opportunity … to expand solar in [DC], but also to help create employment opportunities for youth and now others to work in this industry,” Wells says. Washington recently doled out millions in grants to energy companies with that goal in mind. “We’re expecting the grantees of the $13.2 million to look toward Solar Works for qualified employees,” Wells adds. The first Solar Works cohort graduated on August 4, and their fall successors are scheduled to begin on September 5. Many from the first group of 12 plan to bring the skills they’ve learned to energy internships and jobs. This summer, Rawlings completed nine installation projects, saving low-income families an estimated $205,000. He’s already interviewed at a local solar firm.